Patriotic Example. – The congregation of the Second Baptist Church in this city have set an example that may challenge emulation, but for self-sacrificing patriotism cannot be excelled. They met not long since and by unanimous vote gave their church bell to be cast into cannon to be used in the public defence. To show that this was not an empty promise made for effect, they immediately had it taken down to be put to the use indicated. At the same meeting at which the resolution above stated was passed, it was determined to subscribe a sum sufficient to purchase enough metal to add to that in the bell to form into a battery to be called the Second Baptist Church battery. Mr. John F. Tanner, an influential member of the church, and largely engaged in the foundry business, promised on behalf of himself and associates that the battery should be ready at an early day, and without cost to those who furnished the materials. The churches in New Orleans (a large proportion of them being Catholic” have, with the sanction of their Bishop, adopted the same course. 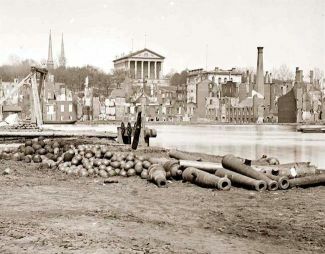 A Confederate battery typically consists of four cannons plus accompanying soldiers. The “Second Baptist Church” battery apparently serves only as an informal nickname for the battery to which the Second Baptist Church bell contributes.